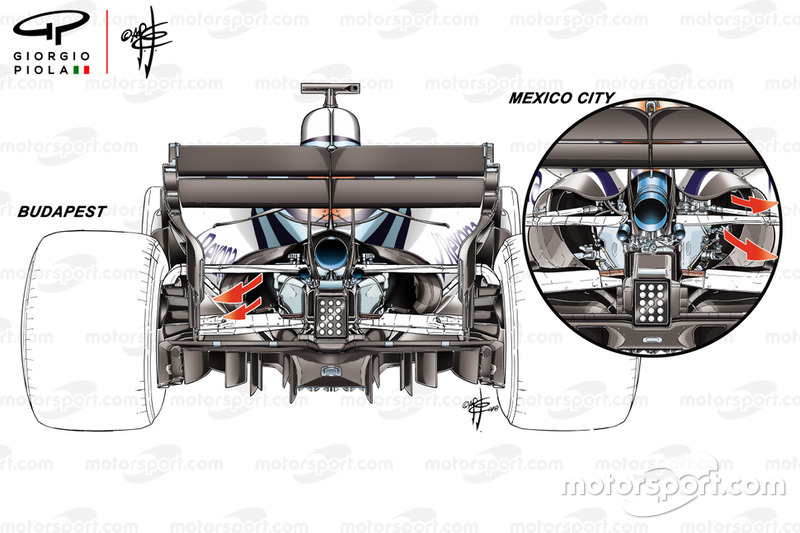 This overview of the FW41 shows some of the design decisions taken by the team for 2018, smart moves you’d assume, taking some of the more interesting developments used by Mercedes and Ferrari during 2017. The team took both the nose ‘cape’ and extremely complex bargeboard footplate designs used by Mercedes, while seeking to gain performance from a less than elegant version of Ferrari’s low-slung side impact support spar positioning to improve the sidepod design. 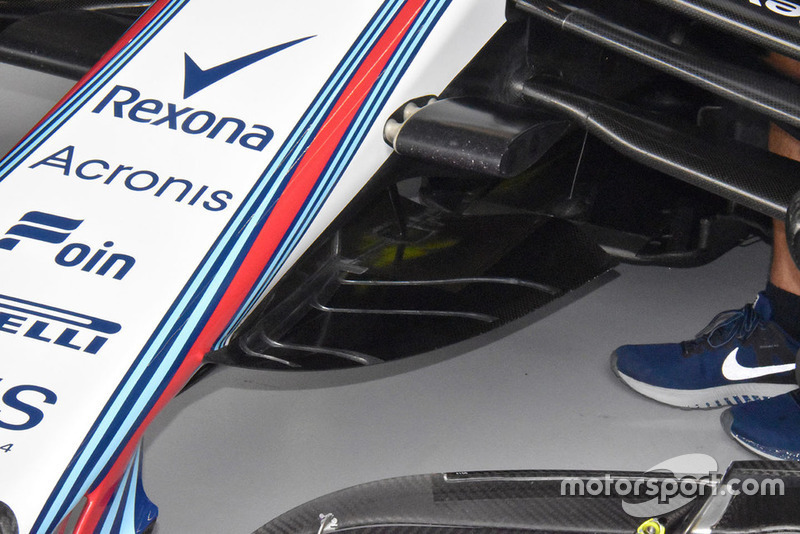 The cooling demands of the FW41 seemed excessive when compared to their other Mercedes-powered kin. This often led to the team having to use a very large outlet at the rear of the car, as seen here in Hungary and even more so in Mexico. 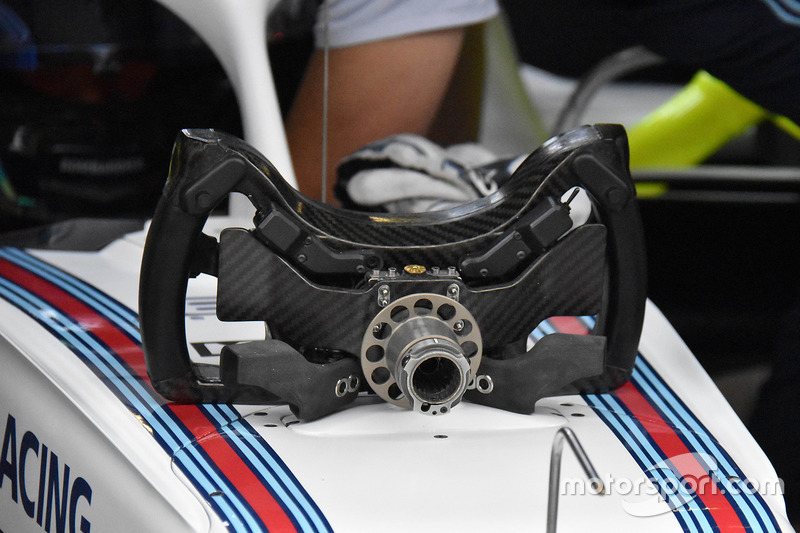 Williams remains the only team not to have their LCD screen mounted within the steering wheel, opting for a butterfly-shaped wheel instead. A look at the rear of the steering wheel and its various paddles for gearshift and clutch control. 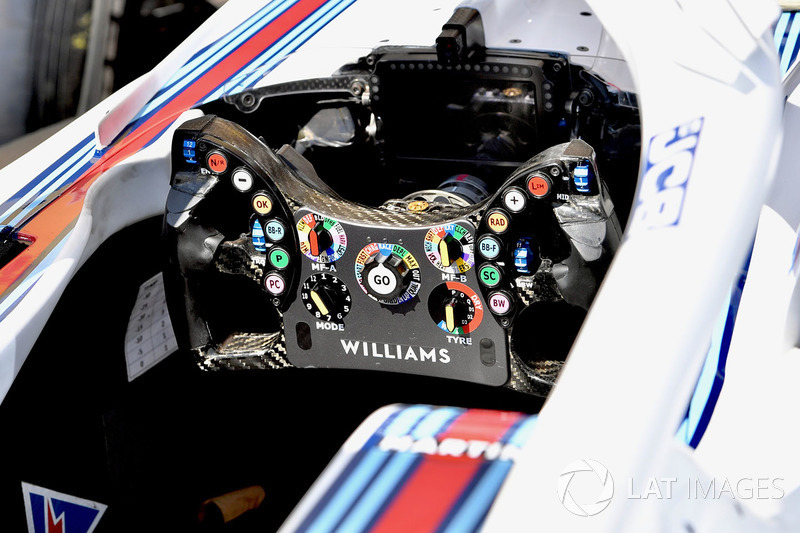 Additional cooling was required for the Bahrain GP and so the team used this more expansive panel on the side of the cockpit. 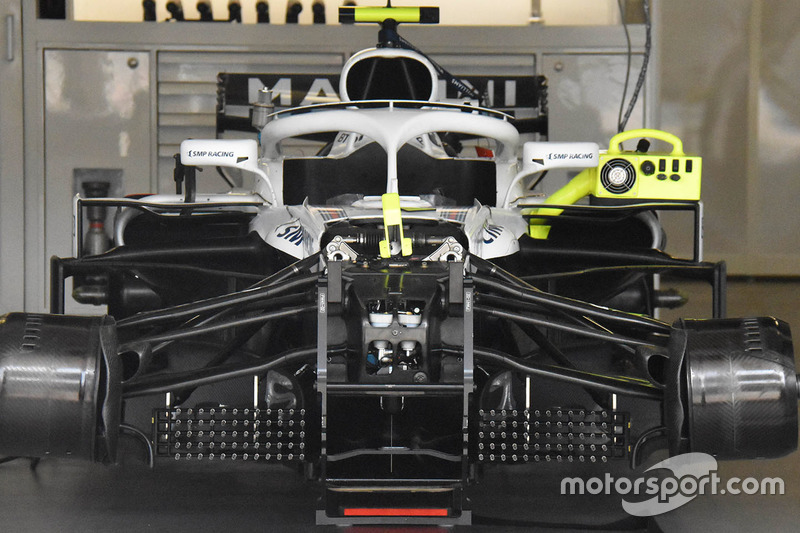 Without the front wing installed, we can see the kiel probe array that the team mounted in and around the front wheels in order to evaluate the vortex shed from the neutral and flapped section of the front wing. 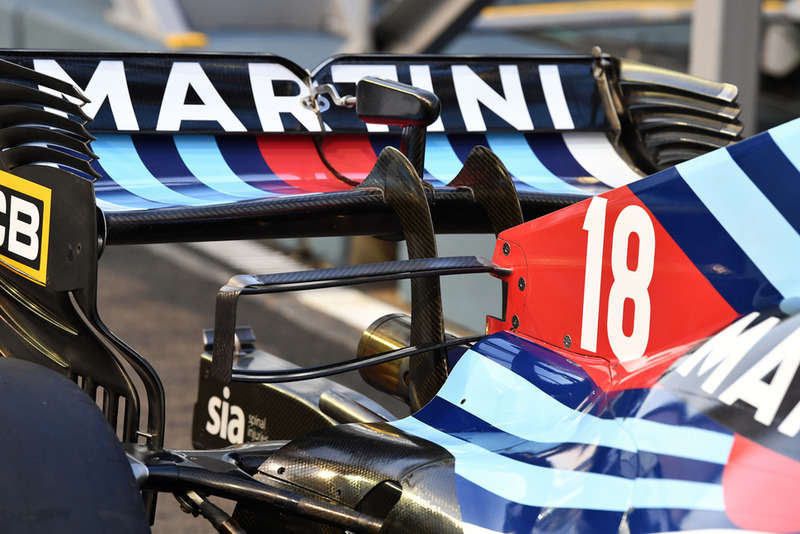 The team used this shoulder kiel probe array mounted on the side of the airbox/engine cover to collect data at the Spanish GP. 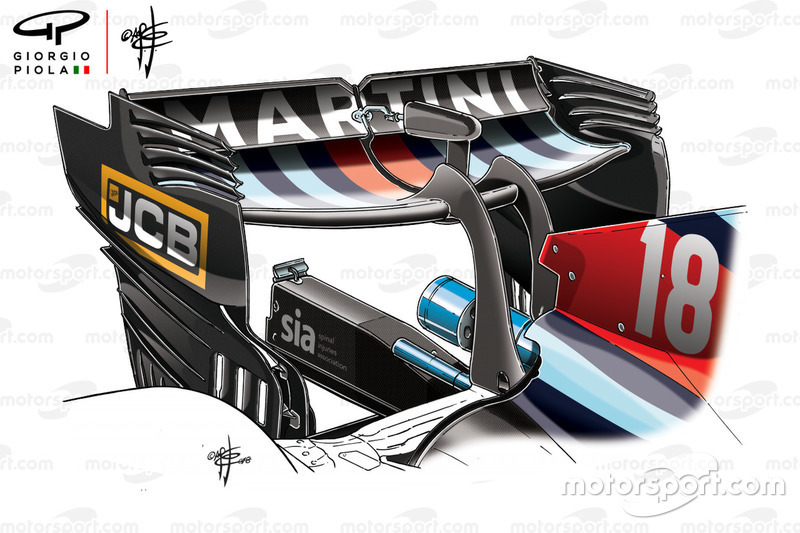 A fantastic illustration of the FW41’s spoon-shaped rear wing as used at the Canadian GP. 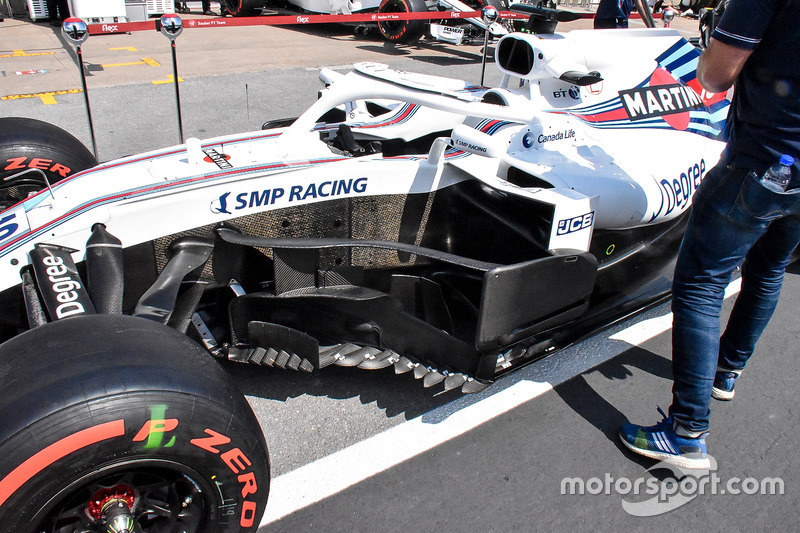 In perfect light, Giorgio gets a great close-up snap of the bargeboard region on the FW41 at the Canadian GP. 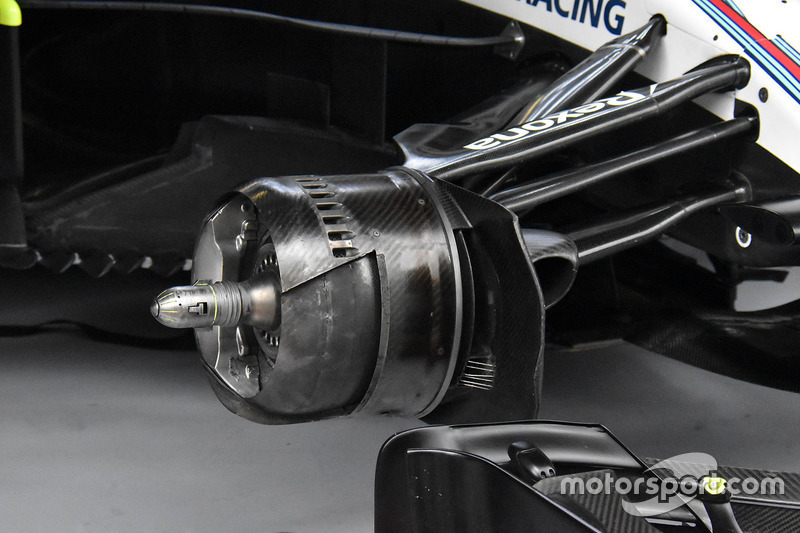 A close up of the front right brake assembly, at the Austrian GP, including the brake duct which featured numerous outlets to help transmit the heat generated under braking into the core of the tyre. 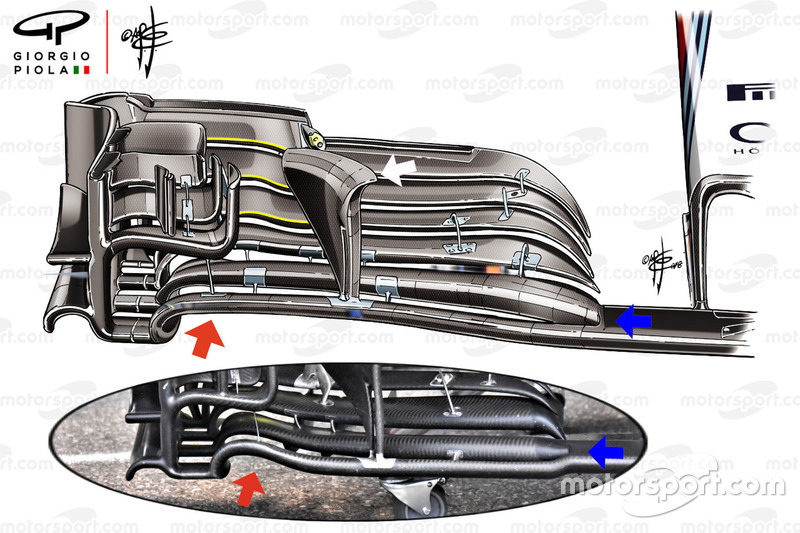 It introduced a new front wing at the German GP, which featured a revised mainplane both at the connecting point with the neutral section (blue arrow) and the arched section (red arrow). The outer flapped section of the wing also saw its shape changed (highlighted in yellow), whilst the ‘r’ cascade had its upper surface twisted. The team sprayed green flo-viz paint on the new wing to make sure it was performing as expected. 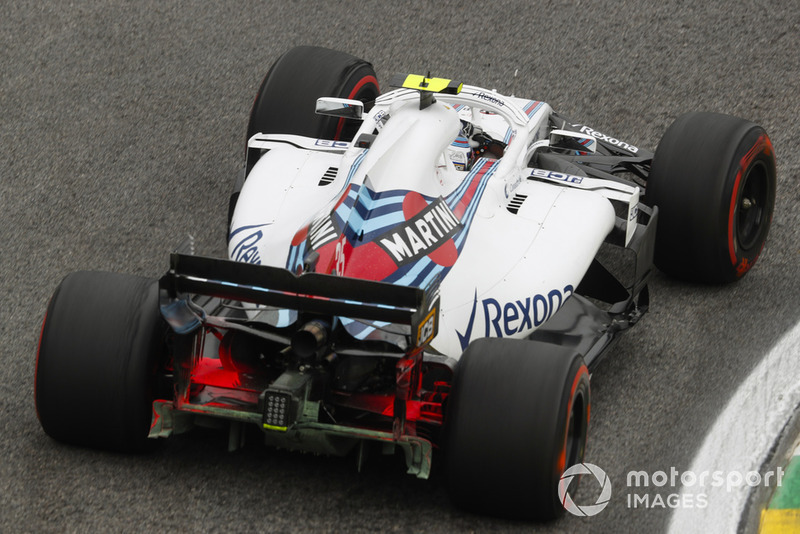 Williams followed this up with another, more expansive flo-viz test, with paint sprayed on not only the front wing but also the suspension, bargeboards, sidepods and floor. It utilised a large cooling outlet (red arrow) and double element T-wing, rather than the single element version (blue arrow). 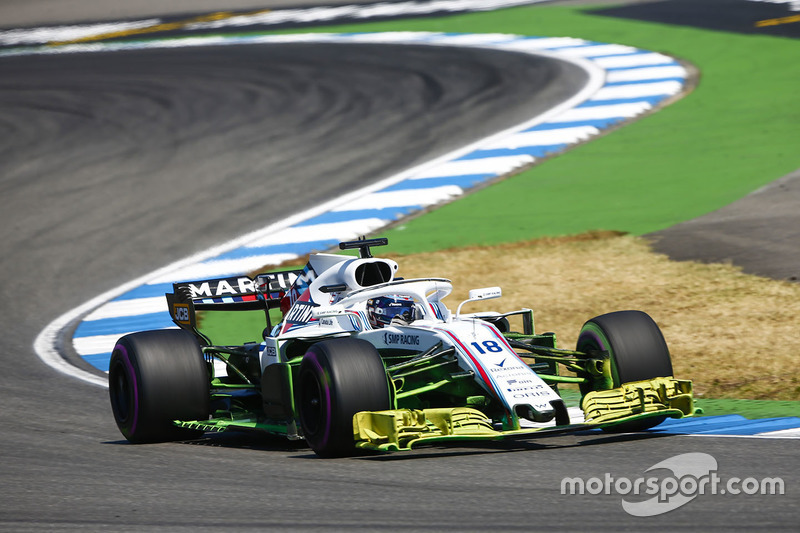 It also went back to a conventionally shaped rear wing, rather than the spoon-shaped one used in the opening phase of the season (green arrow), but retained the use of the open-end style louvres, albeit with five slots rather than three. The team mounted a large kiel probe array behind the front wheel to gather data on the revised wake it generates with the 2019-style front wing. 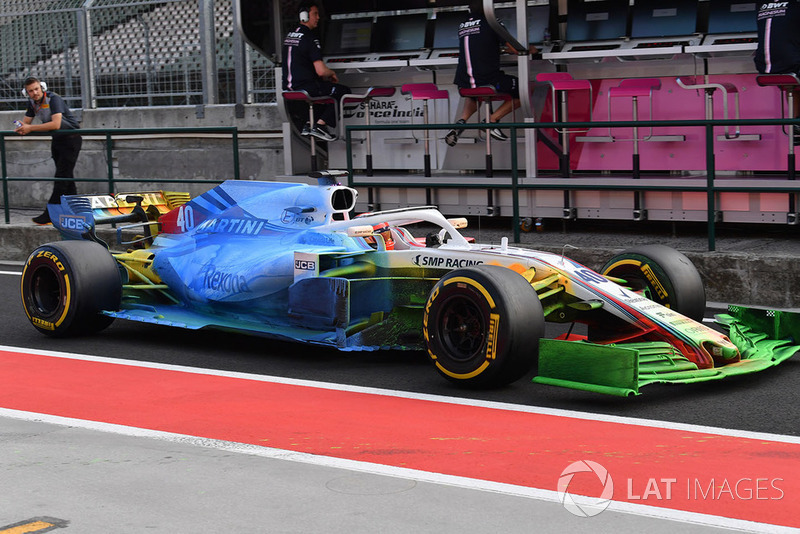 Williams used a huge amount of flo-viz paint at the Hungarian GP as they studied the effect a 2019 style front wing would have on the flow field. 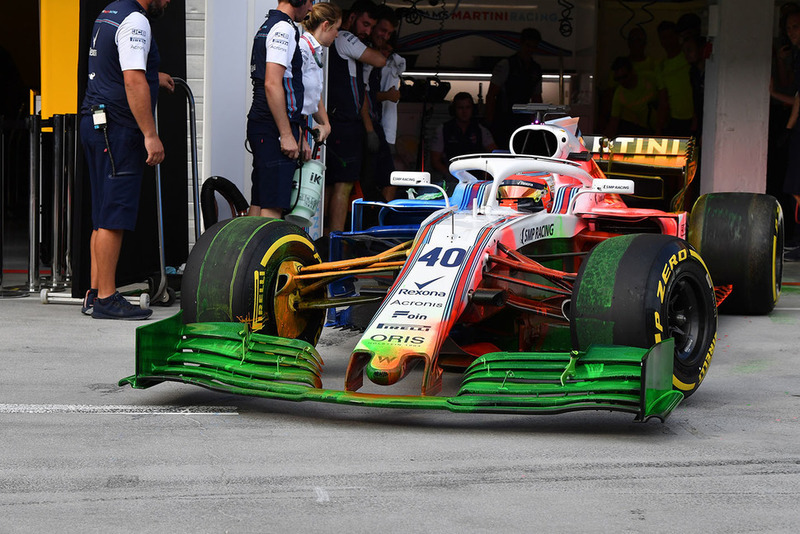 Different colour flo-viz was used on different parts of the car in order that team could work out the separate flow structures were affected. 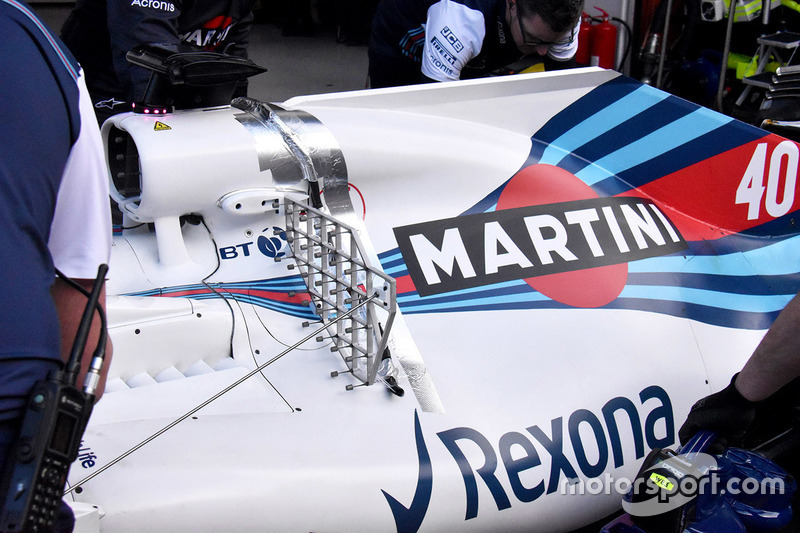 The team placed additional sensors on their ‘cape’ solution in Belgium as it hoped to capture more data. 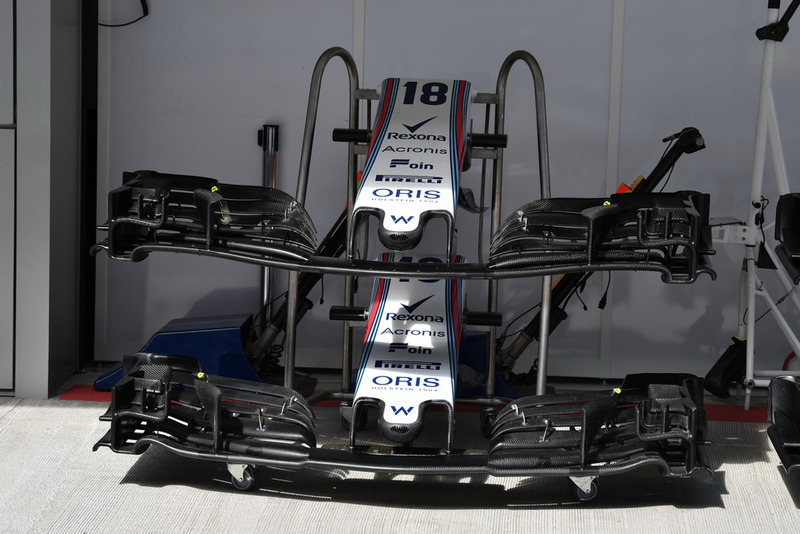 Williams used a large, double element T-wing when it required the most downforce, as in Singapore. 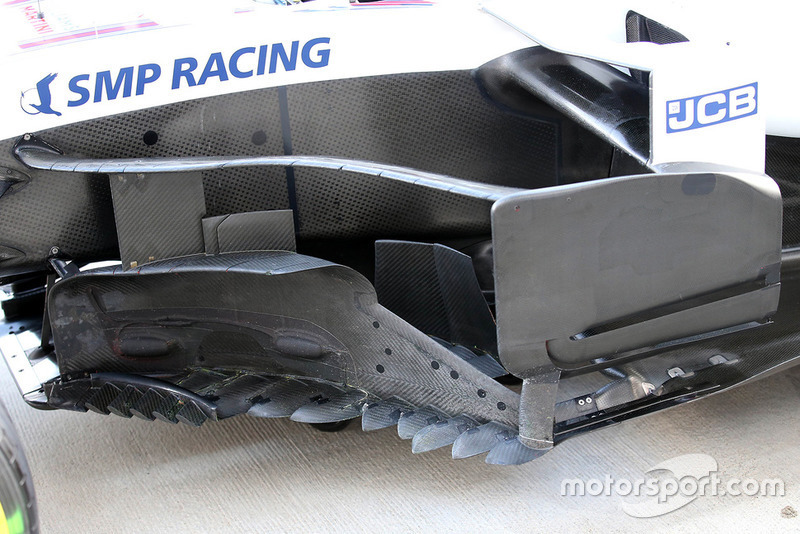 A side view of the bargeboard, with their serrated footplates and the Ferrari-esque sidepod deflectors. Also note the boomerang winglet above the bargeboards which has to have multiple slots in them that coincide with those below. 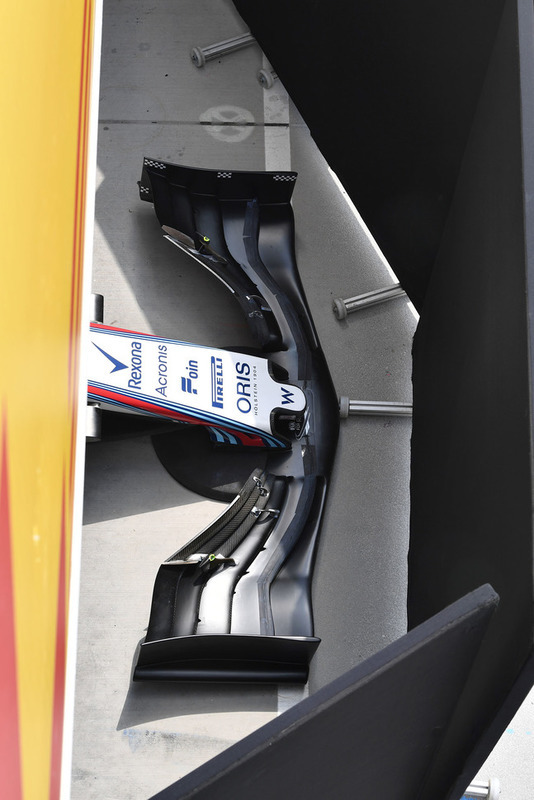 Both front wing options were available for the Russian GP, the upper of which is the newer specification, with a revised mainplane shape, flaps and ‘r’ cascade. 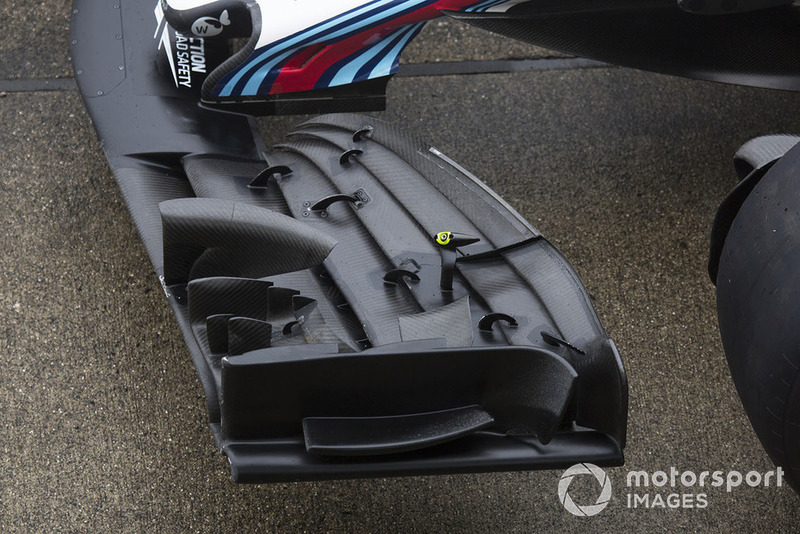 A fantastic top-down view of the FW41’s bargeboard region, with its complex footplates and slotted splitter extension, as taken at the Japanese GP. 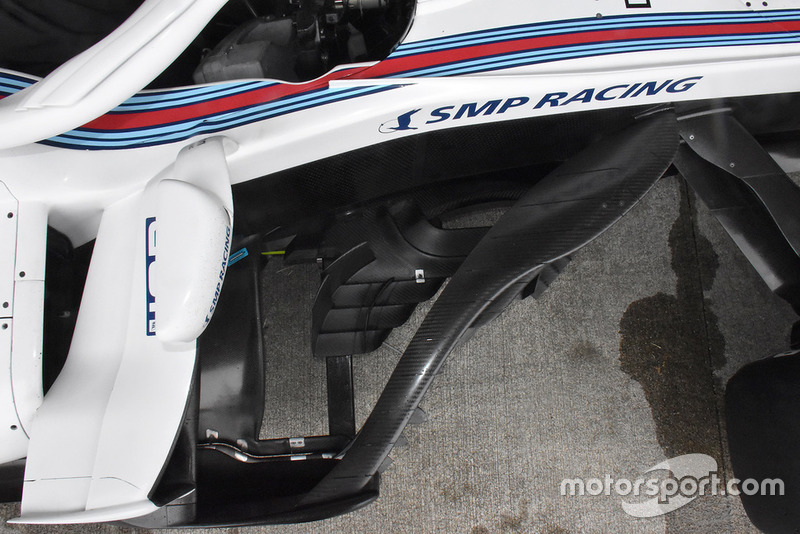 An overview of the FW41’s front wing at the Japanese GP, also note the slot in the nose pillars in the background. 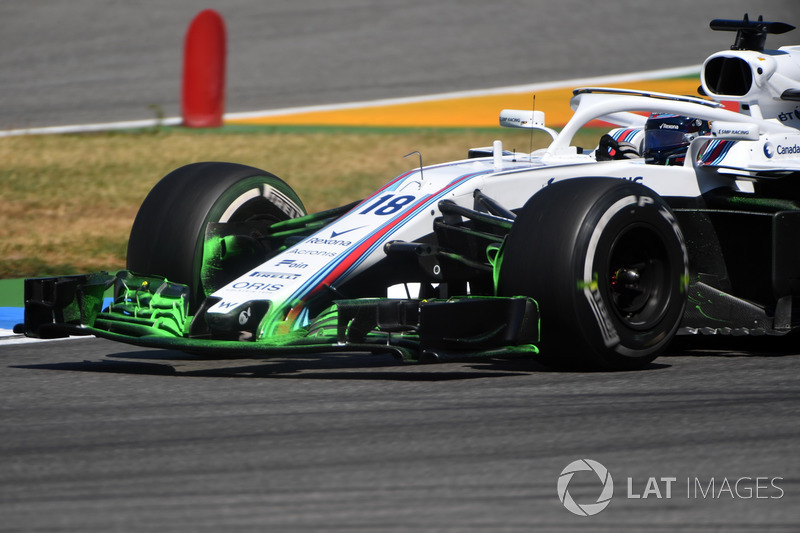 In search of answers, it slathered the rear end of the car in flo-viz during Free Practice at the Brazilian GP. 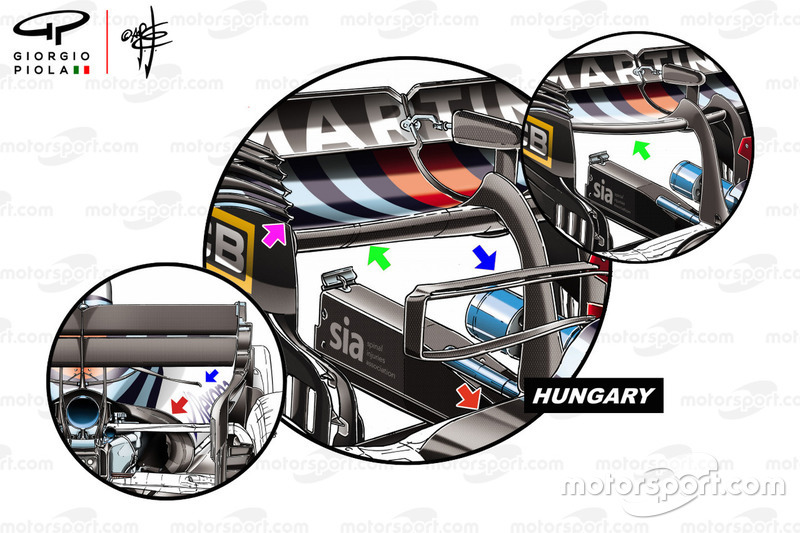 A top-down overview of the 2019-style front wing trialled at the post race test in Hungary. 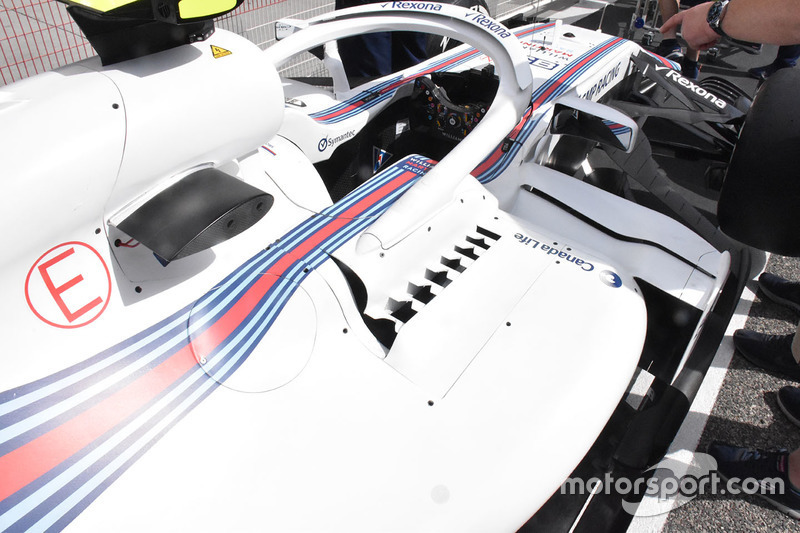 Also note the chequered stickers placed on the endplate which in combination with a high-speed camera mounted on the side of the nose shows the team how much deflection takes place out on track.